Consider your vehicles engine oil the blood of your car. Checking it on a regular basis is a vital part of keeping the engine running properly and ensuring you get the most miles out of it. The oil not only lubricates the engines internal moving parts, keeping them from wearing too quickly. It also helps keep the engine clean and prevents dirt buildup which helps keep the car from overheating. Even though checking your oil is important, not many of us know how to do it. Don’t be discouraged, checking your cars oil level is a quick, simple job. All you’ll need is a rag or paper towel, and your cars owners manual if you have questions. First, check the owners manual for your car and follow the automaker’s recommendations. Most newer cars have electronic oil monitors and don’t have traditional dipsticks for manual inspection. If checking the oil yourself, make sure the car is parked on level ground and the engine is cold, so you don’t burn yourself on a hot engine part. With the engine off, open the cars hood and find the dipstick. Pull the dipstick out from the engine and wipe any oil off from its end. Then insert the dipstick back into its tube and push it all the way back in. Once you’ve done that pull it back out, and this time look at both sides of the dipstick to see where the oil is on the end. Every dipstick has some way of indicating the proper oil level, whether it be two pinholes, the letters L and H (low and high), the words MIN and MAX, or simply an area of crosshatching. If the top of the oil “streak” is between the two marks or within the crosshatched area, the level is fine. Don’t forget to check the oil’s color. It should appear brown or black. But if it has a light, milky appearance, this could mean coolant is leaking into the engine. Look closely for any metal particles, too, as this could mean there is internal engine damage. If you see either of these conditions, get the car to a mechanic for further diagnosis. If you suspect a coolant leak, have the car towed. 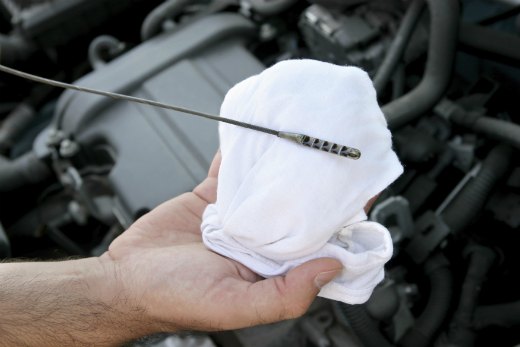 If everything’s okay, wipe off the dipstick again and insert it back into its tube, making sure it’s fully seated. Close the hood and you’re done. If the oil is below the minimum mark, you need to add oil. Use the grade of oil recommended in the owner’s manual. It will usually have a designation such as 0W-20 or 5W-30. You can buy it by the quart at any service station or auto-parts store, as well as in many supermarkets and discount retailers. To add oil, remove the oil filler cap, usually located on top of the engine. Since over-filling with oil is bad for the engine, you should add oil a little at a time. Start by adding about half a quart. Using a funnel helps avoid spills. Wait a minute or so and check the dipstick again. If the level is still below or near the minimum mark, add the rest of the quart. Unless your engine is leaking or burning oil you will rarely need to add more than a quart. However, if a second quart is needed, add that in slowly as well, checking as you go. Screw the oil filler cap back on securely, and you’re done! We hope you found these tips helpful when checking your cars oil! Remember, if you don’t feel comfortable performing maintenance on your car, bring it to a reputable auto body shop. If you have a vehicle that isn’t running at all, and needs to be transported from its current location to another, contact us at Auto Transport 123!